Omor, when was your GDG founded and how many members do you currently have? Omor: GDG Sonargaon has been founded in 2014 with the aim to contribute to the development of the mobile ICT ecosystem in Bangladesh. In my current role as the chapter co-lead, I focus on organizing meetups and codelabs and keeping the internal community knowledge up to date. We’re named after the former capital of Bengal, Sonargaon, a city of great cultural importance. We have over 1K members. Most of them are students from the 25+ universities in Dhaka, making us the largest youth developer community in Bangladesh. To help us coordinate activities at university campuses directly, we recruit university ambassadors from those campuses. We select them through a formal process of submitting a CV and a case study, followed by an interview. As for technology focus, ~90% are Android developers, the rest are in Marketing. More than 30% of our members are women (40% among our university ambassadors). Omor: Dhaka is the heart of all business activities in Bangladesh. All big tech companies have their offices here. The universities create an ideal environment for new developer communities to emerge. We saw many of them starting here and continuing organizing meetups in other cities. We partner with GDG Dhaka, GDG Bangla, Mozilla Community Dhaka, Bangladesh open source network, Women in Digital, Facebook DevC Dhaka, Bangladesh Innovation Forum at some larger events. How big are your typical meetups? Omor: The most typical meetup would be a codelab or study jam for 40-60 attendees. Our flagship events like Google I/O Extended will easily attract 300+ attendees. 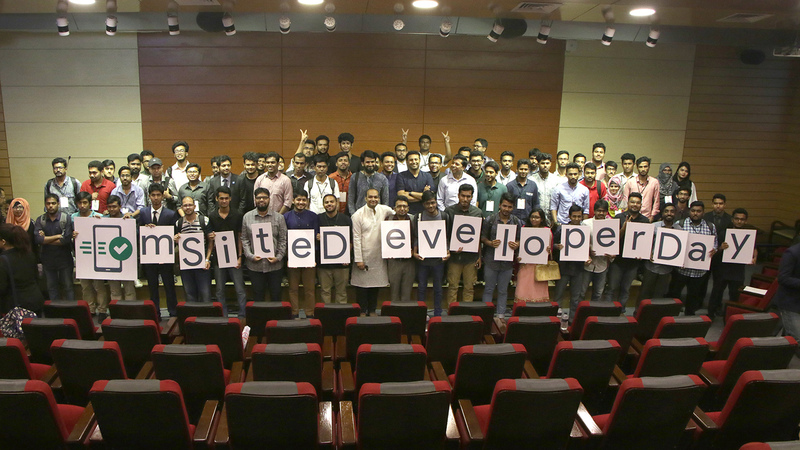 On March 18, 2018, we hosted ‘mSite Developer Day’ to celebrate the certification of 410 students/developers (incl 81 women), from 15+ universities with a ‘Mobile Sites or mSites’ certificate from Google. This event was attended by ~240 certified developers, eminent university faculty, industry leaders along with the Bangladesh ICT Minister Mr. Zunaid Palak spoke at the ceremony. Omor, why did you want to become a GDG organizer? Omor: I joined GDG Sonargaon in 2015 as a volunteer, shortly after my university graduation. I have an Engineering degree and had been working with microcontroller-based hardware driven robotics. I wanted to learn more about Android apps, because I needed to build one to control a device I had built. After I had learnt Android mobile basics in a study jam, I decided to start hosting small meetups for university students. I learnt about community management and leadership from our GDG Community Managers, Ashraf Abir and Istiaue Reza and became one of the lead organizers at the Google I/O Extended 2016 in charge of guest speakers and also hosting the event. Being an organizer enabled me to share my technical knowledge through a platform that also enables me to to learn about technology. On top of that, I was able to further develop leadership skills, which has helped me to grow in my professional life. We’re interested to learn how you manage the chapter as organizers. How do you divide your tasks and responsibilities? Omor: We are 5 main organizers (2 leads and 3 co-leads; 25% are women). We have our internal team mentor and Community Manager, Ashraf Abir to help us with leadership and delivering the best meetups possible. Tasks and responsibilities are shared based on our skills and experience. We have an event team, developer and management team and they take care of everything in their respective area of expertise. We organize soft skills training sessions (e.g. public speaking, presenting) for our campus ambassadors. To help us with process management, we have a separate Google Drive, Gmail group and Google Photos account for organizers. What has worked for you when you were looking for venues and speakers for your meetups? Omor: We’re always looking for a space that will improve the experience for our event attendees. Our largest events were held at universities. Having our own ambassadors at the campuses makes it so much easier to arrange everything. As for speakers, we maintain a database of experts in different areas. So it’s usually a mix of existing contacts and a call for speakers, based on what the topic of the event is. How do you select topics for your meetups? Omor: Our GDG focuses on web developer skills and startups, so most of our meetups are around these topics. We also look what events are being organized by Google and what is relevant for our local ecosystem. In order to invite the right audience for each topic, we use a form where they indicate their skill level. Because we have so many members from universities, most of our meetups are beginner level topics. What is it you like the most and the least about being a community organizer? I like to create opportunities for young developers to learn and share experience to better prepare them for their professional careers. I would like to meet with organizers from other chapters more frequently and wish to have an opportunity to attend more Asia Pacific Google events that would be sponsored for organizers. What achievements are you most proud of as organizers? Omor: I think the whole 8 month process of having the developers successfully to go through the mSite certification is the biggest achievement so far. We also hosted the largest Android study jam in Bangladesh. For 47% of the participants it was the first time they were able to build their own Android app. So far, we have successfully trained over 1K Android developers in our study jams. How do you find balance between your organizer life, work and other things you have going on? Omor: I have been an organizer for quite some time, so I developed a routine that enables me to balance everything. We have regular organizer hangouts to go over everything that needs to be decided and we’re in touch by email. Are there any unique challenges you’re facing at the moment in your chapter or in your organizer team? Omor: We have now more than 500+ mSite certified web developers in our chapter which is the highest in any chapter in Bangladesh. We’re helping them to find new careers by making connections with future employers.